The Fern and Mossery: 53-Year Old "Bottle Garden" Terrarium! 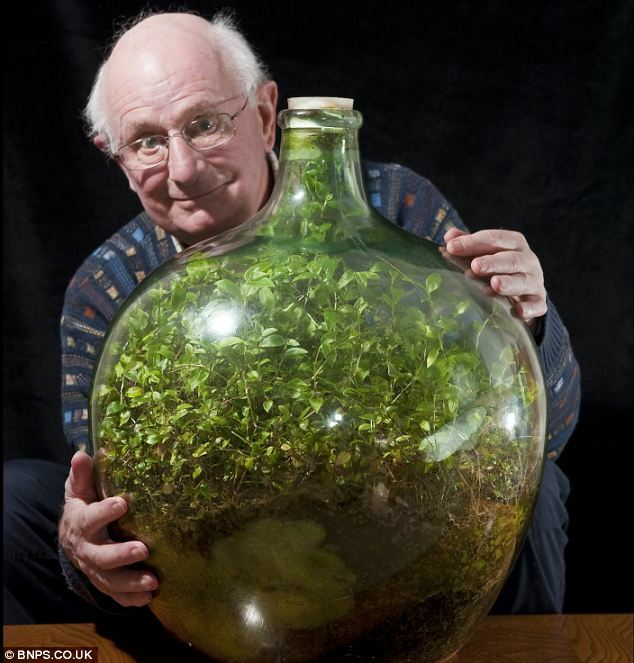 The Daily Mail reports that David Latimer fashioned this terrarium out of a "ten gallon carboy, or globular bottle, which once contained sulphuric acid" and spiderworts in 1960, last watered it in 1973 and then sealed it up. The entire system has been self-sustained for over 40 years! This story seems to corroborate my hunch that, while we are all entranced with teeny-tiny terraria, the best vessels for creating an established ecosystem seem to be the big ones. A Carlo Rossi 5 liter wine jug housed my longest-lasting terrarium. Said wine jug terrarium also developed the algae bloom looking stuff in the soil layer like Mr. Latimer's behemoth. There is also one in the U.S. that is the same age as the owner. It's 40 years old! The owner of the terrarium is an artist who has dialogue with it! Leslie D. Pippen is his name! That sounds awesome! I'll have to check it out.